I have owned this one of these little boxes for a few years now and was rather disappointed when I discovered that one of it's coolest features wouldn't work (as advertised) on PC based systems, just Macs. The feature I'm speaking of is Audio PassThru, which is supposed to allow you to send both, the midi and audio signals from your iPad app to the DAW on your computer, through the USB Lightning connection. The only problem is, a few years back, when I bought the iConnect Midi 2+, I found that AudioThru only worked on Macs, but not on PCs. The issue back a few years, was Macs allowed for Aggregate Devices to be added and Windows couldn't. I'm not sure if anything has really changed for those of us who are still stuck in PC land. Anyway, I am curious if there is anybody out there who has been able to use the Audio PassThru function, going from an iPad app to a PC based DAW. All the documentation that I have found says that Audio PassThru will work with either PCs or Macs or maybe they just failed to mention that one of the major features doesn't work on a PC. 1:50 of this video suggests downloading an Asio 4 driver so you can set up aggregate devices. I am not a PC guy, but maybe that will work? 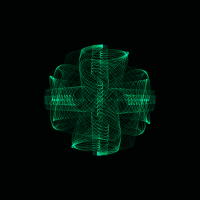 I made it work well with asio4all agregate on a PC with Sonar. I have had this same unit for a few years as well and find it extremely unreliable ! Read through this and other forums and you will see the constant frustration. Midi note drop outs, sometimes have to restart the unit, or plug and unplug........etc etc.......its always something. There are times I will have it up and running and think its great but something always happens to screw up the workflow and hours are wasted trying to figure it out. i have had more success with Studiomux but even that has its own problems. Wish I could find the perfect union between my iPad Pro and Ableton/Maschine that I use !! In all my research online into this, the general consensus is that the only reliable setup includes the use of the iConnectAUDIO4+. i find iOS music making is absolutely amazing at the moment and the level of innovation on this platform is often mind blowing ! However, I am astounded at the lack of hardware options or apps like Studiomux that pair this platform with PC/Mac DAWs in an intuitive and reliable manner ! i'm happily using my iconnectaudio4+ on windows. no idea if the Midi2+ works on windows though. 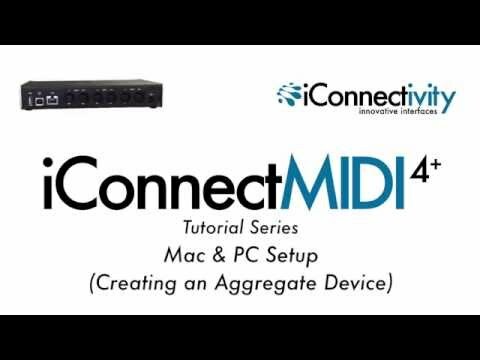 but the Ica4+ can easily send midi and upto 16 channels of audio from any ipad/pc/mac to windows. I should have mentioned that I'm running Cubase Elements on my laptop fed by a Zoom R16. The two work quite well together for basic recording, but the idea of being able to hook up an iPad with its audio/midi through one simple cable was very cool. Unfortunately, I haven't been able to make that connection fully work, yet. I've tried different configurations and drivers, including ASIO4 and completely disconnecting the R16, but nothing seems to make a difference. I don't believe this is a Cubase issue, but I can't say for sure. All the midi connections show up and work fine, but iConnect Midi2+ doesn't show up as an audio source, so if you want audio from the iPad, you gotta hook up an 1/8" jack to the headphone out. When I took a look in the Windows Settings > Devices, I could see the iConnect Midi2+ listed with some other devices, like a wireless mouse, which is why I think this is a Windows issue. I know the manual "says" that Windows "automatically" creates an Aggregate connection, but my experience says, "I'm not so sure..."
2. "USB Composite Device" (Standard USB Host Controller). 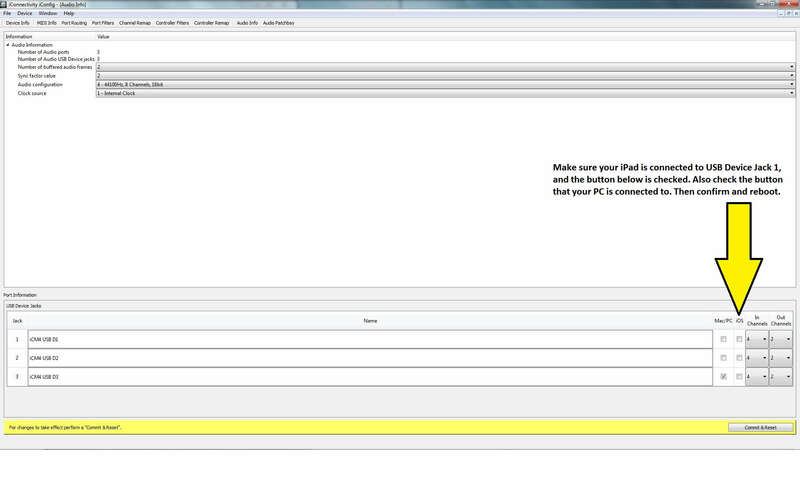 IIRC, the iPad audio (thru headphone jack) is disabled when following the steps above for enabling AudioPassThru. Keep it at 16bit 44.1kHz and keep it as the Master Clock. Reduce the number of audio channels, Audio Ports, and Audio USB Device Jacks to the bare minimum that you need (i.e. iPad and PC). If you're aggregating multiple audio interfaces via ASIO4ALL, this increases the unreliability. But this is necessary since the iConnectMIDI2/4+ doesn't even have a basic headphone jack output. I sold my iConnectMIDI4+ in 2015 and later got an iConnectAudio4+, which was more reliable with much lower latency. Got rid of that too though and just export WAV files to the PC now. Did another test run using ASIO4 and it worked, well kinda. I could record the audio or the midi from an iPad! But now, Cubase is routing the master audio back to iConnect Midi2+ and doesn't recognize any of the 8 audio inputs from the R16. When I switch the ASIO4 driver back to the R16 ASIO driver, I get my 8 channels of audio inputs from the R16 back, but it doesn't recognize the audio input from the iConnect Midi2+. How's iConfig these days? Can you save and quickly reload multiple 'config setups' now or is still just one, and have to reflash each time you load one? Thanks. To be honest I just rewire as I need. Don't really make configs. Once you get used to the grid it takes literally seconds to do the exact config you need. And once I have it setup I usually leave it that way for weeks. They have an entirely new app now that's noob friendly but sacrifices everything great about iconfig so i'm sticking to my older driver version and software. (I even backed both up on my Dropbox). It works with asio4all for me as well. Although I don’t use it for audio, only midi, I have the 4+ for audio. Really hope they update iconfig at some point, it still works but needs some maintenance. Yes that makes sense, they must have updated the windows drivers for Auracle optimization but not iconfig, but haven't updated iconfig for over a year and a half. Which version of iConfig and WIndows USB Driver is the most reliable in your experience? I have an older driver (v3.34.0). I'm not 100% sure. I'll get back to you when I am at my desktop. Do you by any chance have the setup for 3.34 ? Would like to back that up too. I think v3.34.0 was released sometime around July 2016. Uploaded it to my Dropbox. I did some further testing using both Cubase and Reaper, but the results were the same when using the iConnectMidi2+. When using the Zoom R16 Recorder into Cubase or Reaper, you need to use the Zoom ASIO R16_R24 driver in order to use the 8 audio inputs, 2 audio outputs, mackie controls, etc. The ASIO4All driver does not recognize the Zoom R16 inputs or outputs, but does allow for Audio PassThru. In the ASIO4All control panel, you can see both drivers and switch back and forth, but when you switch to the ASIO4All driver, you lose all connections with the Zoom R16 and there's no way of combining parts of, or use both, it's one or the other. That's why I think it's still a Windows issue and the way it handles audio devices as opposed to Macs. Macs seem to allow the adding of aggregate audio sources, where as Windows appears to have no such function.